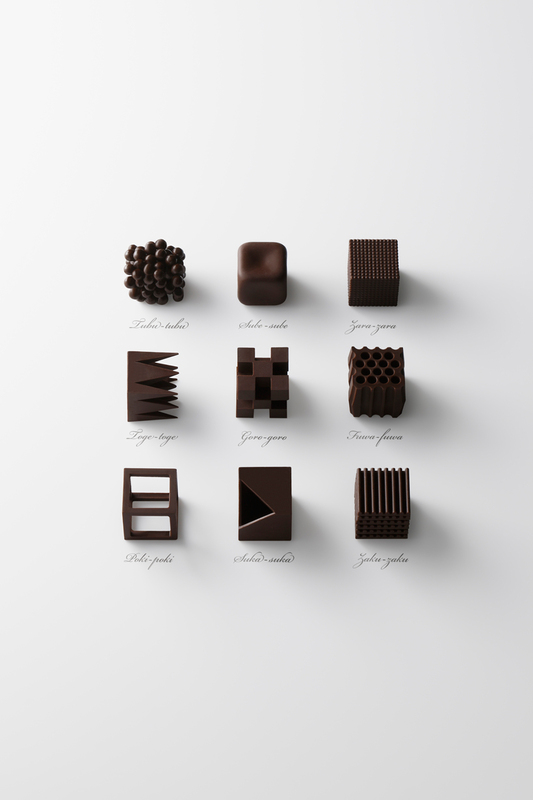 Japanese consultancy Nendo has designed a box of chocolates – and they’ve been intricately crafted to form geometric shapes. Unlike regular treats, these chocolates are equally as appealing to the eye as to the mouth, each possessing unique shapes that represent different Japanese textures. The consultancy says that the different textures determine and change the taste of the chocolates – even though they’re all made from identical ingredients. There are nine different-shaped chocolates, which all fit the size dimensions of a 26mm square cube, and which are named after Japanese expressions that describe texture – for example, “tubu-tubu” means small beads or balls, and “toge-toge” means sharp pointed tips. They are made with the same technique used for scale models in Japan, known as “plamodel”. Small parts of each chocolate are moulded by machinery, then pasted together by hand to form the shapes. 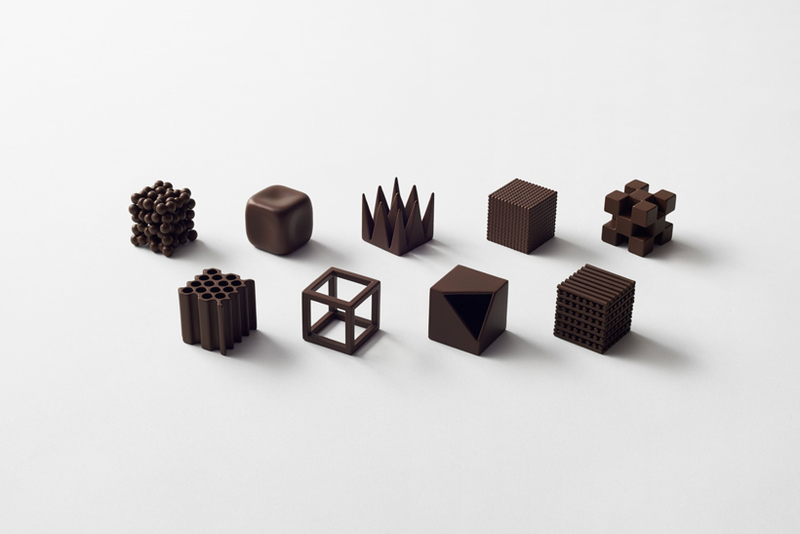 While Nendo created the design, Hunter Confectionery Co. created the chocolates themselves, casting them into shape. 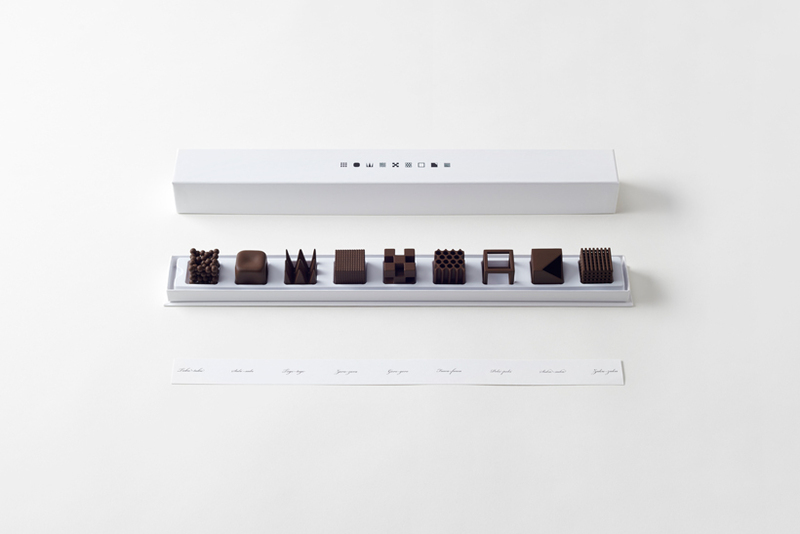 Nendo designed the chocolates for international design trade fair Maison&Objet, after the consultancy, led by Oki Sato, was named their 2015 Designer of the Year. The “chocolatexture” chocolates will be available to buy exclusively at Maison et Objet Paris 2015 from 23 – 27 January, at a price of €49.50 for a set of nine and €19.50 for a set of three. They will also be sold at the Sogo & Seibu Department store, Japan from January 24. Following on from the theme, Nendo will create a “Chocolatexture lounge”, with piping and furniture that resembles the treat, at this year’s fair in Paris. 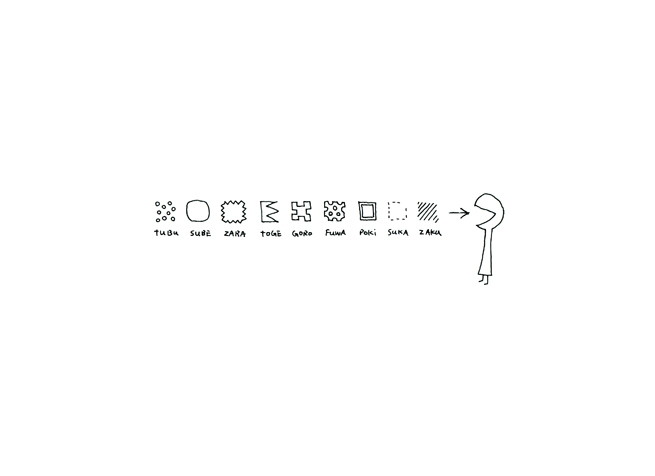 All images are courtesy of Nendo.